SOLD $133,250 ESTATE AUCTION!!! 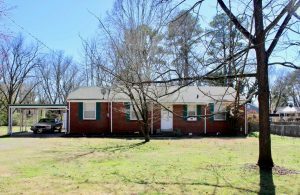 2 BR, 1 BA Brick Home / Motor Home, Car, Gun and Personal Property | Middle Tennessee Real Estate :: Maples Realty & Auction Co.
Move in ready, 2 BR, 1 BA all brick home with 2 car detached garage and oversized carport, fenced in backyard, and large deck. Mature trees, convenient to dining, shopping, and schools. Personal Property: 1979 Cadillac Coupe Deville w/ 62,634 miles, 1992 Allegro Bay motor home w/ 74,408 miles, Ruger 357 Magnum, cedar chest, tables, hand painted glass figurines, Avon glassware, cookware, iron skillets, plates, clocks, lamps, 2 dump trailers, 2 Murray riding mowers, floor jack, wheel barrow, work benches, saw horses, chainsaws, battery charger, blower, pressure washer, Troy-Bilt wood chipper/shredder, weed eater, yard tools, miscellaneous hardware, pocket knives, console stereo, vinyl albums including Elvis, record player, costume jewelry, wheelchair, walker, bath tub seat, vacuum, coolers, heaters, grill, tool box, vintage fishing rods and reels, Coleman lanterns, tents, Whirlpool refrigerator, Admiral washer, Maytag dryer, and much, much more. Real Estate will Sell at 11:00 a.m. Directions: Middle Tennessee Blvd, to right on Bradyville Pike, to left on Minerva, to right on Gardner Drive, Property on right.